The Pagan & the Pen ~ An Online Magazine! | Eclectic Articles, Columns & More! Check out our COLUMNS below! Want More? Hit Categories. Articles Posted Regularly! In 2015 the rate of information in the possession of humanity began to double every single second that passed by, all at the fingertips of the average contemporary person. The fallowing is one philosophical interpretation of the secrets of the occult sorceries, the divinity of god, the matter of dark energy in astrophysics, the Fibonacci sequence and the golden ratio alike; as well as the understandings of freemasonry, the hermetic sciences, guru mysticism, the Jewish Quabala, and alas, the great modern Quantum mysteries themselves intertwined; or as an occultist might say, the western, or the technical approach to magick itself. For Time is how we perceive our world, heaven and hell by means of consciousness within the evolving tides of entropy and gravitational pulls otherwise known as space or the electromagnetic field. One of the few things known of the Ancient druids is that their philosophy obeyed the Pythagorean method of perspectives within the branch of mathematics. A well respected study in Roman culture as well as modern society. Pythagoras of course being associated with the geometry of trinity. Referenced and described within the Jewish Kabbalah’s and the tree of life’s archetypal philosophies world wide. All religions aline through these archetypes and every human being shares theese similar traits according to both science and human intuition. Just as a humanoid entity, the devil, or any figure of cosmic influence is a figment of the conscious imagination. The environment you coexist within now in fact is also immaterial and projected upon despite how solid this reality may appear and feel to the senses. Which are ultimately electrons within the nervous system firing to create a reaction based off of other clusters of energy for the mechanism that which it supports again entirely made up of electrons and energized particles. For if you were to imagine 5 puzzle pieces amongst a 100 piece puzzle you could nearly perceive a fraction of what the human brain is actually capable of interacting with compared to a theoretical picture of the rest of the conceivable surroundings, environment and universe based off the modern perceptions of dark matter and energy consisting of 95 percent of the material within the entire cosmos. Meaning, our perceivable universe, reality, or idea of it, is both distorted by the mechanism we call memory, while also being limited to minuscule levels of consciousness in comparison to the contemporary understandings of the matter in existence through science; due to our lack of perceiving said energy and matter. Any Concept of God, plural or otherwise derives from the hope or love, that darkness does not come for ones soul once these physical husks are shed like skins from a snake in a dry dessert. However hope can be comparable to fear. A tool for the sick and powerful. As well as to ones mind whence under control of it; and a barrier to overcome by all. Where as the passion of love may consume those who long for its bright flame so beautiful against the black veil of the void and abyss we reside in only to be burned to ashes. While To love, to hope or to praise divinity through passion by means of consciousness, space and time, is to praise the trinity of life and death, fallacies and truths, the evolutions and the destructions of all things that exist. A True Satanists will fear death above even the idea of their master and savior, the prince of darkness, as does a nihilist. For ideas are but only ones thoughts conjured by the consciousness perceived within the mind, filling in the gaps after the fact, as all things are first a preconceived idea before they are even perceived by the mind’s eye. Sort of like how a golden apple amongst a garden aligned with heaven is a metaphor for universal knowledge. For I am an amateur at all things, but with the potential to be a master of anything I please. This is what is offered to ones consciousness as we are born. These similar vocal cords we share are made up of muscles and flesh that allow for frequencies to be uttered by beings of will, intelligence, and empathy. Our souls, Time and space are but oscillating cords of the spectrum of light, vibrating at speeds capable of projecting reality. While Light is energy, and energy is everything. Only a true genius may recognize the failures or a fault as an advantage throughout life. With Vast oceans of the universe far exceeding the pools of icy depths that we refer to as the seas upon Mother Earths bare chest. For a thing is not a thing because one says it is. However, a thing may be changed by the utterance of a word or the action of a will. Since time and change are one in the same thing correlating with gravity by means of an electrified magnetic field. As With all things connecting to each other. Either in contradiction or within divine trinity. Consciousness is the final frontier as well as the pioneer before the potential of the trinity enlightens the human form. The two slit experiment exists to prove this concept and that the awareness within a brain is connected to a force as strong as entropy and gravity, time and space, length and width in respect to the third dimension of height or depth; which shall ultimately prove to be the golden ratio and the emersion point within the Fibonacci sequence, or as some have understood it, as god, via a scientific sense; or put another way, a bio frequency pattern that forms consciousness and materializes souls from the abyss. This is why when applying depth to one’s idea of consciousness, you can perceive how animals or people amount to different levels and cornerstones of consciousness. The wave function is the most reduced image of a particle humanity posses to this day. One is reminded of how a heart monitor behaves and how a particle is both a wave that exists extra dimensionally while also moving in a straight line through various states of matter as a condensed collection of atoms. Essentially different states of dimensions can be explained by mirroring concepts that relate to our perception in this reality. For one to perform magic one simply may conduct an act, any act at all with conscious or unconscious intent. Thereby affecting reality extra dimensionally both by simply observing or causing change to matter. Break an atom or a construct of any kind apart and it’s contents crumbles into energy rippling across the spectrum. Create something and its potentials will branch out into infinity. A metaphysical idea that manipulates all three pillars and divine trinities within the reality we perceive. As are particles in superpositioned, fractalized, infinite states, until observed. Where as Darkness is nothing but the unknown in the literal sense of the word. A single word or symbol may conduct ones will as an absolute source, and within a true vacuum of nothingness as being limitless. While silence is nothing but peace to a quiet mind. A quiet mind results in ones neatly ordered neural cortex and therefore control of the brains range of abilities. The mind is a tool when trained, ones deadliest weapon in combat and an ever evolving organ finished once upon the time that infinity is understood, accurately depicted and undoubtedly calculated. For Infinity exists along a wavelength of potentials. A priest in order to disconnect a divine concept from their own ego must except this love and shall not be trusted by a wise man, woman or Druid otherwise; whence praising divinity without active or public contemplation less intentions be of base desire. As unquestioned ideas and assumptions are impure and fatefully ignites ignorance ,fear and impunity throughout it’s followers, destroying the potential of the lives of passing innocent victims. A mind not educated or nurtured may descend into impulse and chaotic randomness without aim or purpose but to continue a consistent outpour of energy until the narrow minded path becomes a corner for one to experience a spectacular finale of death. The impulse to kill is the restraint or the act of constricting ones consciousness by force and grips one young by means of hatred, fear and anger. The release of power is so euphoric that the mind clouds due to the intensity and a colossal false sense of control that one feels when once, one felt so helpless and weak. However, in truth, energy and potential are only released, not gained in the act of rampage. Nothing is accomplished, nothing is gained by destruction, neither emotionally or physically to ones self nor ones potential in life, only released. Potential being the only true power in all existence. Due to its fathering or seeding of all realities. The pain within us is fire, one can be burned or just cook a meal to sustain the mechanism. Ones euphoria through hate or violence is short lived and often fallowed by blocked pathways. Simply put, Life could not exist without the median and fluctuations of cosmic forces. Forces to which originate from a single source in waves. Where some refer to this as divine intervention others deny any existence of a spiritual field or plane and consider the study of consciousness as pseudo science despite the two slit experiment or the fact that 95% of existence is scientifically unaccounted for; as energy is propelled forward by change and the matter within the universe. Tetrahedrons expand and condense as we perceive reality as an informative simulation explained by E8 emergence theory. This is the truth and trinity of life. Evolution results from this union of E=MC squared and therefore awareness arises, bonding without conclusion because to evolve is to be immortal. Just as Pain can be endured by those with the skills endowed by the mind, insanity can be cured in time with help from the calm and the spiritual as death will be feared by those with false delusions of destiny; while the divine person is without fear, without limits and will never again know what it is like to lack control of ones self and in extension, there perceived reality. A modern Druid explores the spiritual spheres, concepts and perspectives by means of objectivity and the contemporary abilities available. It is expected that True Druid’s shall acquire multiple skills; including but not limited to a medical practice of some kind or perhaps of all kinds, a sort of artistic intuition through manifestation, one or more styles of hand to hand combat to blend and become ones own, a contemporary, tactical, and empathic comfort when surrounded by death along with a fundamental branch of the many sciences, however the entire tree is preferable. Where as Philosophy is something one may study as long as they are capable of remembering anything at all. For Children hold more potential then any of us because of the futures yet to behold and even more choices which have not been made before ones experienced moment in time. The Imagination is an omni directional play-dough that can absorb and transform into anything. Fueled by their own potentials, a young mind may perceive a thought as if it were there with them on this plane of reality due to their innocence from the delusions of adulthood. Simultaneously creating and experiencing a thing without the help of any other force but one’s own consciousness. A conscious entity spawning within the 5th dimension or perhaps an enclosed bubble realm of an entirely literal vacuum of nothingness would be capable of creating and physically manifesting a thought as real as themselves since the only thing that would exist would be there consciousness absent of any other constricting forces or limits. Sort of like how a child using their imagination can perceive things that aren’t there easily using their consciousness alone. Likewise a self aware entity falling down a black hole and surviving the experience to find themselves a being within a pocket universe or dimension would theoretically be capable of perceiving and interacting with atoms on a quantum level without limits; including the three dimensions we exist within now. Although, as one falls passed the event horizon, more likely the body and consciousness would become quantum spaghetti, even ones soul spreading across the universe multi-dimensionally, technically understood as units of Planck spherical packets of energy. Likely the truest death one can experience. A real Absolute vacuum of nothing could only have existed Once in all of the realities throughout space, time as well as within any other dimension that exists. For even the vacuum of space is filled with dark matter and fields both known and unknown. A true empty space holds no potential, no physics, no fields, no borders and no static at all. Only within this reality could the potential for everything in the universe be born because in this moment infinite potential may occur. For quantum mechanics proves reality basses itself on potentials. Absolute Nothing perhaps may exist on the very outskirts of existence itself and of course within a gravitational singularity however no other positions as far as one can tell are at all possible. A 4 dimensional entity or perhaps a person who taps into the dimension residing higher then the individual consciousness, therefore the collective consciousness, would potentially be capable of perceiving themselves in multiple or possibly every reality including all timelines in existence. As a wave function is the baseline for every atom in the universe, and a wave crest is a potential version of the same origin point that which an infinite line extends from. Therefore, what may be understood as a doppelgänger or divided dimensions within another timeline is actually multiple crests upon a wavelength separated by periods of the dismantling of particles to be reconstructed and then rise to a new peak, similar to how an electrocardiograph blips away a heart beating and a wave moves through the ocean. If one were to transcend beyond the third dimension without permanently casting themselves into oblivion, one could travel across the realms of trinity. Of course this is all speculation based upon the most modern research as is a Druid’s goal to understand and perceive what others demand them incapable of. As Energy is not created or destroyed and neither is our souls or what is referred to as awareness within the void. We are merrily fragmented across dimensions constructed by interlaced frequencies. Human consciousness is Fractalized and changed by forces of nature in which our souls are energized into particles that flow and change within the tide. Nature being both loving and spiteful, passionate and calm. A Forrest is both a gift and a means of getting lost, a tool and a thing to stand idle. All things balance as all things contradict themselves. A Manipulation of real materials or waveforms to perform feats that many are unaware of. Some modern thinkers believe magick was once understood as the umbrella for every sort of education and understanding there is to teach the human consciousness. Perhaps Having been taught in divine places such as the Tower of Babel or the Library of Alexandria. Rest In Peace Hypatia, Shakyamuni, and Jesus of Nazareth, misunderstood mystics and diviner’s of conscious Forces; Enlightened you were as others assume public history has remained untainted and true to thy names; in that the victors across time have accounted history without honesty or integrity as human nature depicts; and there in that our ancient ancestors were savages saved by the might of Roman society or some other predominantly white raced nations ruled by man’s ego with supremacy and violence. We are an evolving species molded by both the surrounding darkness and the need to perceive the light within. These contradictions are annoying but quite prevalent and spectacular. However politics and metaphysics relate to each other only indirectly and far from the public eye. That is, when it isn’t in plain sight. For any given idea is in fact magical because our consciousness is the source of every god or goddess known and unknown as well as to every atom in the universe struck from superposition. One may believe magic does not exist while literally engaging in a magical act just as a fish can live in the ocean and never realize it’s surrounded by water whilst beneath an entire world unknown to it. Humanity is on the verge of discovering a connection capable of allowing human consciousness to see passed the barriers of darkness we now call dark energy and theologically refer to as angles, demons and the afterlife; so to then vastly expand the electromagnetic spectrum, understand our souls through neuroscience, perceive gravity through quantum mechanics and actually experience the universe in new, in-depth ways. Potentially Giving birth to an age of wonder, and advancements of every shape and scope, several times more impactful than the industrial revolution. However first we must remove the cancer. Not a people, not a religion, not a political party, and not consciousness itself as Adolf hitler actually preached to a starving and desperate German nation. Ignorance is fear turned to greed and anger, or an attempt at averting pain and change. Fear is what happens when a thing is aware of potential pain before it occurs. Fire reduces things to ash to start again and to disperse amongst the wind. But it can also be used. It’s a choice to use the fire within ones self or to allow it to burn ones body away. Alone the ability to choose is what shapes reality by the will within. So to be ignorant of ones power of choice or potential is to disregard ones metaphysical abilities. Just as one relinquishes ones free will voluntarily to another is to be enslaved by one’s own ignorance. We are all slaves because we all give our attention to others and also because no human is omnipotent. There is simply a pyramid of slavery to which each person is more free than those below the next. Freedom is determined by one’s abilities to which they are capable of performing, paralleled to the society they are in. To successfully correct the United States government and dismantle the corruption within it without a shot fired or a fist thrown the people themselves unified must say enough. While to maintain relative peace and order during and after a revolution the legislators and lobbyist alone within government shall be removed and replaced with a direct democracy via modern technology, either a blockchain or a quantum computer may offer sufficient security systems. The supreme court should also specifically assure no mob mentality or mass assumptions are used to create a law or perform any act unconstitutional. All inquiries will be judged publicly so that a fair explanation can be presented to the people. Every other position and station of government shall remain without interruption. With a single exception being the department of public education. Seeing as ideas are the most powerful force in our reality, the minds of a societies young should be protected with more paranoia then one’s personal treasures or even one’s soul in this dimension. For To mass convince the young of something is to set the future in stone. Where as To encourage imagination is to set the future free of limitations. Therefore one must be sure they aren’t allowing their child to be actively influenced by the unconscious beast within us all. The satanic archetype is most accurately depicted by the Native American tale of the two wolves within every human being. The wolf who wins being the most feed. Similar to the yang and the yin of the universe. Hate, rage, ignorance and deceit are actions of a mortal upon this plane. As Unconsciousness is both where the soul is born and the base of life itself. Love, passion, and hope are aspects of the soul. Expression, love and joy are all thats worth living for, as they release the consciousness into the either to grow and magnify potentials with magnificence. For The knowledge of the Druids is not lost, simply scattered across the akashic field replenished and restored by the human soul as is all life. Let it be known as was Hermès Trismegistus. I pray to you, the archetypal sisters of trinity, Nut of Egypt, mother Kali of Hinduism , the Celtic Morrigan, feared by Zeus as Nyx and Asteria in Roman myth, first woman Lilith, goddesses of night, ever chased by man’s desire to surmise and dominate your infinite mysteries, first consciousness of myth ascended from the abyss of chaos, let the fates of trinity be merciful to me. Let my mind and soul be protected by you and your power flow through me. Not as a weapon, a tool of the beast’s or for vengeance but as a divine spark. Let my will sooth you dark goddess. For I do not fear you. I embrace your unknown power and accept the darkness not as evil but as an infinite generator of potential. The sun with all it’s brothers and sisters both imploding and expelling existence in waves. Three is for those who know of the holy fruit. Knowledge be not for these contradicting fools. But love be for us all through and through. Place your soul against mine thy universe and please define your truth. I am but a humble servant weaved within your tapestry, just a molecule that is a part of you. Please. Bless me time, bless me space, bless me mind and bless me with haste. Outshine this beast within that wishes to rage with unconscious hate. For It is only the fires of the cosmic flame contained within a sculpted vase. I control this body made up of my awareness, some electrons and a bit of space. While time controls the realm in which I think and that I pace. With this line I here by pronounce these three pillars be dementalized and shown true to thy mind. In the form of trinity and bliss and with the same voice that I cried after my first breath. https://youtu.be/CyGWML6cI_k direct democracy and software agents to replace government. https://youtu.be/yCm9Ng0bbEQ is the world getting better or worse? http://www.industrytap.com/knowledge-doubling-every-12-months-soon-to-be-every-12-hours/3950 rate of information data increase. Ronald Hutton, Blood & Mistletoe the history of the druids, Yale University Press New Haven & London, 2011. Robert Macoy, A Dictionary of Freemasonry, random house value publishing, inc. 2000 edition, 1815-1895. The Occult Book a chronological journey from alchemy to Wicca, John Michael Greer, sterling publishing Co.,Inc., text © 2017. Mysteries of the Qabalah and sepher yezirah, by Elias gewurz & rev. Dr. Isidor Kalisch © 2008. CPSIA info found at http://www.ICGtesting.com, printed in USA. In the cupboard-sized alcove of an independent bookstore in Vermont, the red spine of this book caught my eye. Then, I saw the title, and almost of its own accord, the book was open in my hand, my eyes scanning the pages. Though I’ve not quite finished with this book, I thought what a perfect complement it might be to St. Patrick’s Day today. I am fascinated by all things Celtic, Irish, mythology, spirituality, and the world of fairy. Maybe it was all those formative years in the hospital where my mind was free to roam and wander and wonder. But, one of the things I’ve truly enjoyed about this book is the author’s academic study of the historical connotations. For some of the poem-like structures, she breaks them down into the original language as well as puts them in plain English. The pan-Celtic Goddess Brigid is my Patroness, so naturally I’m interested in books about Her. All too often, I find that there’s a tendency to reduce Her to a facet of the Wiccan “Great Goddess” or the “Divine Feminine” of Goddess spirituality. There’s also considerable confusion between the Goddess Brigid, and the Christian saint that bears the same name. I’m a polytheist Pagan, and for me Brigid is an individual, discrete Goddess (or set of Goddesses; a matter which Daimler addresses in her book). We are fast approaching Yule, and most witches and pagans that I know will undoubtedly appreciate one type of gift: a book. For those seeking some focused on hands-on magic, I’ve recently combed through a couple books on this subject. 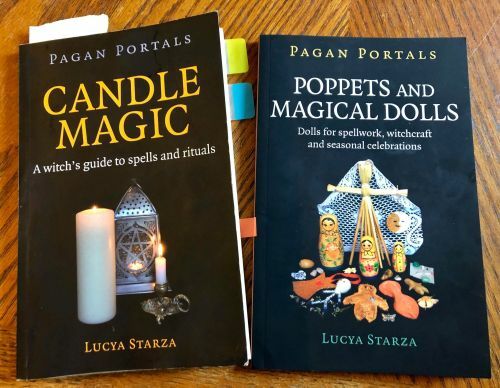 Late this summer I picked up two titles from publisher Moon Books, Pagan Portals: Candle Magic and Pagan Portals: Poppets and Magical Dolls, both by author Lucya Starza. Both provide introductions to their respective subject, which was perfect for my purpose. As a priestess novitiate of the Daughters of the Sacred Grail, I lead a monthly group study of practical magic. 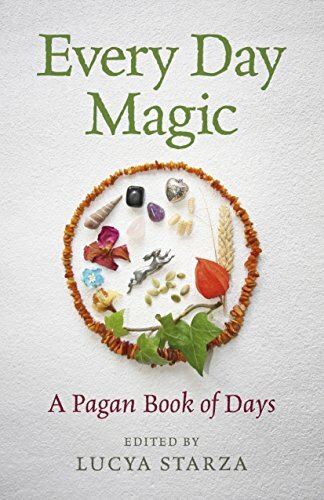 Several of the ladies in our local hearth are fairly new to hands-on magical practice, so I was looking for a couple books to serve as touchstones for the study. These books fit the bill almost perfectly. There once was an old bear who was a shaman for the creatures in the Cantley area of Doncaster. Though he was a powerful shaman – some said, the most powerful in all of the borough – one winter, he was plagued by owls. Owls in his medicine bag. Owls on his prayer mat. Owls in his wardrobe. Owls in his hat.